Dozens of simply delicious, juicy fruits on this compact variety. It's perfect in a patio pot! Gorgeous sweet scented peach blossom and unique deep-burgundy foliage. Fully winter hardy, and very easy to grow. Supplied as a 50-60cm tall, grower quality, multi-branched bare-root tree. Grown on a dwarfing rootstock. Will grow to approx. 1.2m (5ft) in 5 years. A simply stunning Patio Peach tree, 'Crimson (R) Bonfire' has been selected for it's unique and delightful burgundy purple foliage and red coloured peach fruits, all on a genetically dwarf tree too. Imagine relaxing on your patio in early Summer - the last of the heavenly sweet scent of Mediterranean peach blossom filling the air. Then in late August, reaching out and plucking one of your very own delicious, juicy ripe peaches! This stunning compact peach tree is so easy to grow, perfect in a pot and because it flowers later than many varieties it fruits much more successfully too. A beautifully symmetrical shaped tree, its foliage has a delightfully rich burgundy colouration. 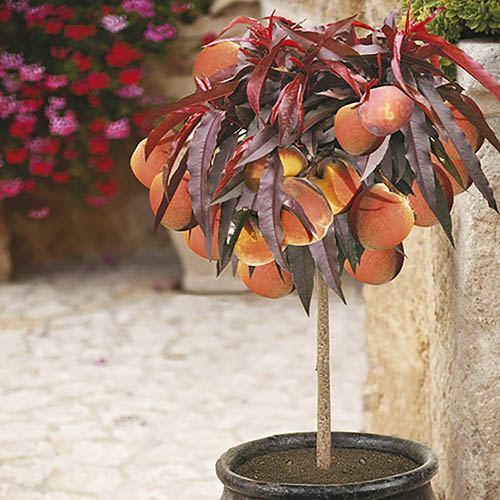 Combined with the crimson peaches it makes a particularly exotic and decorative addition to any patio. Completely winter hardy no matter how cold it gets, you can look forward to your very own harvest of home-grown peaches for years to come. TOP TIP: Peach fruit yield will be increased by keeping the fruit tree canopy dry in blossom and pollination time, such as in a greenhouse, conservatory or lean-to. Although self-fertile, using a dry small artist's paintbrush to brush pollen from flower to flower will hugely increase fruit set too. This will massively reduce the curse of Peach Leaf Curl too. Patio Peach 'Crimson (R) Bonfire' really is a delightful little tree, for years and years of enjoyment. Supplied as a 50-60cm tall, grower quality, twin grafted 'bare root' tree. Grown on dwarfing 'Montclair' root stock TOP TIP: Peach yield will be increased by keeping the fruit tree canopy dry in blossom and pollination time, such as in a greenhouse, conservatory or lean-to. Although self-fertile, using a dry small artists paintbrush to brush pollen from flower to flower will hugely increase fruit set too! Patio peaches can be grown in at least 45cm (18in) containers filled with soil-based John Innes No 3 compost. In February each year, feed with a balanced fertiliser, and repot every couple of years. Naturally dwarf, these patio peaches need little or no pruning to keep their compact shape. Protect the blossom from frost and, although self-fertile, using a dry small artists paintbrush to brush pollen from flower to flower will increase fruit set. When fruit appears, it will need thinning. Remove poorly placed, small or misshapen fruits when they are about the width of your little finger nail. With peaches aim to have a fruit every 15cm (6in). Water container-grown trees almost every day during the growing season and give them a high potash liquid feed every couple of weeks. Avoid excessive or irregular watering when fruit is ripening to prevent the skin splitting. As the fruit develops it may need protection from birds and squirrels.